Orthodox Church liturgical Greek Priest clergy vestments (violet-silver) by Istok Church Supplies Corp.
Istok Church Supplies aims to serve the needs of all Orthodox Christian communities including the Greek Orthodox community. 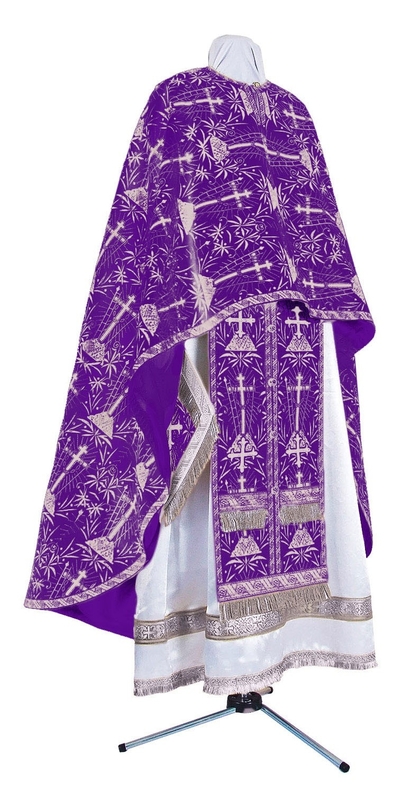 Included in our extensive collection of liturgical vestments are high quality Greek Priest vestments in violet and silver. 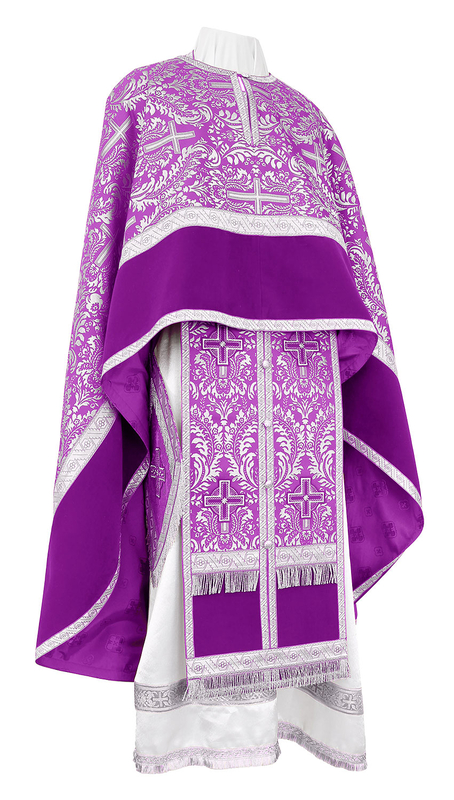 Violet is a variation of purple and our Greek Priest vestments in violet and silver are ideally suited for Lenten period and Dormition fast. Made from excellent quality fabrics such as rayon jacquard brocade, metallic jacquard brocade and fabric with German Madeira thread embroidery, these vestments are perfect for personal use as well as gifting. Depending on their requirements and taste preferences, customers can choose from a vast range of delicate and intricate patterns on fabrics. Our Greek Priest vestments violet and silver are offered as complete sets and consist of five articles – zone, epigonation, epitralhilion, epimanika and phelonion. We provide natural velvet inserts and natural rayon lining free of cost for all orders. Decorations that enhance the appeal of liturgical vestments can be added at an additional cost. We offer three types of decorations – standard, premium and luxury. Customers can also add matching chalice covers and veils to their orders. We can also add an embroidered icon for the back and customers can choose from given list of options. Our made to measure services for liturgical vestments are renowned all over the world. We believe important functionaries of Orthodox Churches deserve to wear custom fitted liturgical vestments during Divine Services. Our experienced tailors carry out orders in accordance with age old traditions while deploying advanced construction techniques to ensure durability. Once you provide us with your custom measurements, we will start working on your individual order. We require a few weeks to process orders and customers are requested to place orders well in advance if they require vestments by a particular date. Browse our extensive collection of impeccable and grand custom Greek Priest vestments – with so many fabulous choices, it’s hard to pick just one!